From lunch deli to a real destination venue, with an expanded menu that includes gourmet burgers, rotisserie chicken, and slow-smoked ribs, as well as assortment of quality beers on tap. A behavioral agency dedicated to making socially significant change in the lives of the families we work with. Offers a unique and easy way for you to enjoy your next camping experience. Vacation trailer rentals parked for you. Your full service outdoor store, RV repair and supplies, and UHaul Dealer. Check us out on Facebook! Professional and experienced financial advisor. Beautiful things for your kitchen, bedroom & bath! ASHLEY FURNITURE HOME STORE – MPB FURNITURE, INC.
Travel Agency, Roadside Assistance, Insurance and More. Full service Solar & Electrical Contractor - Residential & Commercial. Expert appliance repair for all major brands. Visit our website to schedule your appointment online. Mobile food truck & catering for special events. Everything you could want for a great day of golf! We offer flyfishing lessons, flyfishing classes, flyfishing seminars and guided flyfishing trips. Coffee Roaster, baked goods, snacks, merchandise. When planning a vacation of horseback riding, camping, hiking, fishing, or just plain relaxing, let us help! We are a 24 hour Emergency Veterinary Hospital for dogs, cats, equine, cattle, small & exotic animals. Residential & commercial trash service. Need port-a-potty rental for a special event? Offers a one-of-a-kind espresso bar & cafe where you can let your hair down! Wholesale meat and meat products. CARTER, WILLIAM M., DDS, INC.
New Owners Steve and Gina Cleland! We are here to help with all your gardening and farming needs. Take a seat for an inviting cafe experience. You can also have Classy Cowgirl Catering cater your next event. #2 Gill Station Coso Rd. We offer supported hiking trips as well as traditional horse packing trips. RV Park and trailer rentals, country store, fishing tackle, worms, souvenirs, ice, restrooms, showers for guests only, groceries, beer, wine and self-serve food. Full hookups, tent sites, rental trailers, WiFi "Park Guests Only". Since 1993, DK Woodworks has been crafting custom home interiors for a diverse range of projects throughout the west. RV Mobile Service Repair by Appointment. Provides passenger bus service between and in the rural communities of Inyo and Mono County. 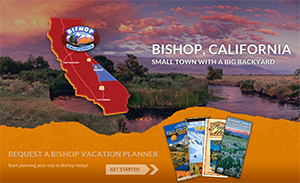 The regional transportation system offers connections between Reno, Bridgeport, Lee Vining, Mammoth Lakes, Bishop, Big Pine, Independence, Lone Pine, Ridgecrest and Lancaster, CA. Three generations of Eds give Eastern Sierra fishing tips, share videos and fun! Eldridge Electric & Son, Inc.
We offer a vast array of camping equipment you can rent. Everything from Teardrop Trailers, Tent Camping Packages and Camping Accessories serving the Eastern Sierra to help heighten your outdoor adventure. Organic frozen yogurt, pie and wine bar. Horse & Mule Boarding and Training. Independent Distributor of Lindal Cedar Homes. Open Year Round and offers full hookup RV sites. Lunch and dinner barbeque cuisine, plus catering for events of all sizes. Gourmet comfort food using local sources. We are a mobile home park with 18 overnight, full hook-up, pull-thru spaces. Also available are full hook-up monthly (short and long term) spaces and some tent camping. We have restrooms and showers. Gas station, general store and deli. Free boat launch, boat & pontoon rentals, food & drink. MEADOW FARMS COUNTRY SMOKEHOUSE, INC. Riding and hiking trips that allow guests the opportunity to climb Mt. Whitney from the west side. A full service critical access hospital including 24-hour emergency care services. Visit the Inn and Ranch at Death Valley. 312 guest units, restaurant, retail, golf and more! Accommodations, RV sites, cafe, boat rentals, group events, gift shop, store. Toyota & Honda dealer sales and service. Pizza and Pasta. Old World dishes for your dining pleasure. Residential and commercial service plus holding tank and RV pumping. Excellent coffee and delicious food that is fresh and organic whenever possible. Catering for lunches, etc., with delivery. Available for special events. Provides service into the Eastern Sierra Backcountry. Fishing licenses, guns & ammo, compound bows, bait & tackle, camping supplies and much much more! General store, cafe, cabins, boat rentals, and shower facilities. Fishing, Hiking, Horseback riding. Fastpacking, mountain running, footwear, clothing, equipment, nutrition. We now have a rock climbing gym! Employs the latest in wireless internet technology to provide the widest coverage for the Eastern Sierra communities. Confidential and Secure Document Destruction. We are the oldest fly fishing guide service in the Eastern Sierra. Local map publisher and distributor for the eastern Sierra Nevada region. Guides to the Eastern Sierra and beyond. Dedicated to connecting people to the mountains. At St. Timothy's in Bishop you will find warm community, reverent worship, and strong faith. Expanded to include Steve's Auto of Mammoth Lakes and Steve's Auto of Tonopah, NV. Summit Capital Financial & Insurance Svc. Bed and Breakfast, where rustic elegance in a tranquil atmosphere awaits you. Food truck serving comfort food with a combination of Latin & Central American cuisine. Toiyabe Indian Health Project, Inc.
Medical, dental and optical services in three locations in the Eastern Sierra. Visit our rustic cabins, cafe, bar and market. Hostel and Store. Private and shared rooms.